Dr Curie Park from IfM's Centre for Industrial Sustainability (CIS) has been working closely with leading Sri Lankan garment manufacturing companies to transform waste streams into high value products through innovative remanufacturing processes and new business models. Garment manufacturing is Sri Lanka’s single biggest industry, generating 44 per cent of its GDP along with at least 30,000 tonnes of textile waste each year. Currently, there are no textile recycling facilities in Sri Lanka and the textile waste is exported or burnt for low-value energy generation for the cement industry. Every year more textile waste is being generated, increasing the waste problem. 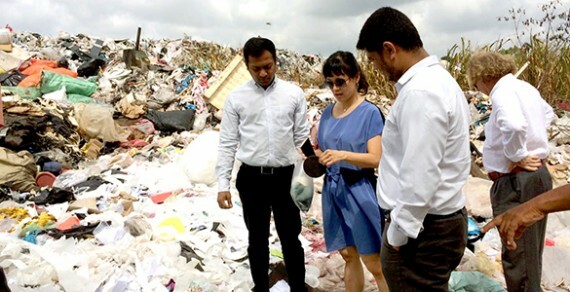 CIS Research Associate Dr Curie Park was the lead researcher in an eight-month project in Sri Lanka to investigate the opportunities for high value innovation in post-production textile waste as part of the international collaboration project, TransTextile. Three interdisciplinary research teams were formed across textile process and chemical process engineering disciplines, and fashion, interior and graphic design disciplines to research and develop innovative ways to add value to the textile offcuts. Five promising innovation routes were identified. These include using the waste materials to make beanbags, denim interior panels and 3D printing powder. A number of Sri Lankan textile manufacturers are now investigating other innovation opportunities and commercialisation routes with CIS. Download the final report here. In a further development, Dr Park has identified a Korean company that manufactures high-press fibre panels from polyester. CIS is working with the company to investigate the feasibility of using textile waste from Sri Lanka to manufacture these panels, which are used for interior and exterior building materials. Dr Park is the lead researcher of the TransTextile project, working as a research associate at the IfM's Centre for Industrial Sustainability. Before her PhD on sustainable design strategy, she worked as a practicing designer running a product design studio. Her research interest is in creating substantial positive impact through design of product, process, business models and industrial systems.